House Bill 275 is a sweeping measure on Public-Private Partnerships (P3’s) that would allow for unlimited privatization of public jobs, while adding to our state, county, and city deficits. New Mexico's UFCW members at the Roundhouse 2/9/16 lobbying to oppose anti-worker legislation! Join us in Santa Fe to defend good-paying jobs for hard-working New Mexicans! 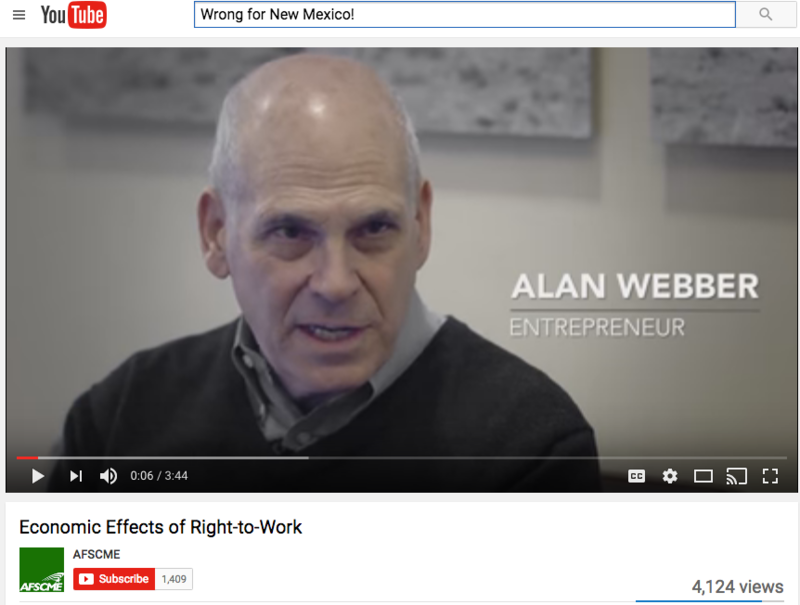 HB 432 is a “right to work” measure that would cripple the ability of labor organizations to negotiate on behalf of New Mexico’s workers. The bill would restrict unions from collecting “fair share” fees from non-members to cover the costs of the union’s legal obligation to represent those workers in collective bargaining and grievance procedures. It would also bar employers from exercising their right to hire only union-trained and certified workers. So-called “right to work” laws are unfair, unnecessary and hurt the middle class. Join us at the House Labor Committee (will likely be held on the House Floor because we're expecting hundreds of people) to kill the anti-worker so-called "right to work" bill and to stop privatization of public sector jobs. Take a moment to remember why so-called "right to work" is a total scam that makes the rich richer while exploiting and endangering working Americans. Public-private partnerships (P3) can be effective tools if managed appropriately, but they require basic protections, oversight and transparency. Unfortunately, HB 275 represents the broadest, most irresponsible P3 bill in the country, in scope of authorized projects, breadth of governmental entities involved, lack of oversight (legislative and executive), lack of public transparency, and financial risks. The nightmares of mass privatization, public health disasters, budget-busting and debt default experienced by other jurisdictions occurred under enabling legislation that was much more carefully crafted than HB 275. Labor organizations support sensible, modest P3 legislations. HB 275 risks good-paying jobs and precious tax dollars. All Republicans on the House Labor Committee support lowering worker pay, gutting benefits, and privatizing good public sector jobs. We need a big showing by the House Labor Democrats to hold onto these good jobs and rights. Ask these members of the House to stand strong with NM Labor and VOTE NO on House Bill 275 (privatization) AND on House Bill 432 (so-called "right to work"). And we'll see you this Saturday in the Roundhouse.